The Cape Cod National Seashore is a 43,600-acre National Park on the end of Cape Cod, about a 2.5-hour drive from Boston. 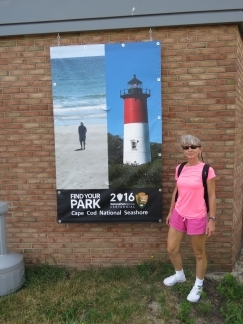 The park includes popular beaches, historic lighthouses, and excellent walking and bicycle trails. It also contains the site of Marconi Station, where the first two-way wireless radio transmission across the Atlantic occurred. We hired a ZipCar for the day and packed in as much as we could, including an excellent lunch stop in Provincetown at the tip of Cape Cod. 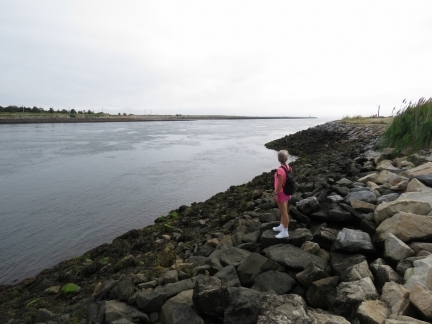 On our way to visit Cape Cod National Seashore, we stopped off at the east entrance to the Cape Cod Canal where we’d passed through a month earlier en route to Boston. The current, visible in the water surface, was flooding at 3.5 knots near the edge where we were standing. The US Coast Guard Station at Cape Cod Canal was built in the 1930s in the Colonial Revival style following the demolition of the original buildings when the canal was widened. Walking the Nauset Marsh Trail along Salt Pond adjacent to the visitor center. Salt Pond is a “kettle pond” formed when the glaciers receded, leaving chunks of ice that melted and created depressions in the earth. 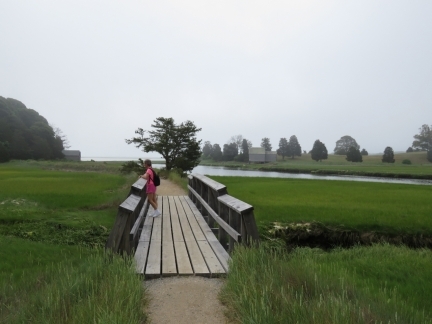 When the water table began to rise at Cape Cod, “kettle ponds” began to appear. Salt Pond initially was a freshwater kettle, but the ocean eventually broke through and formed a narrow channel connecting it to Nauset Marsh. 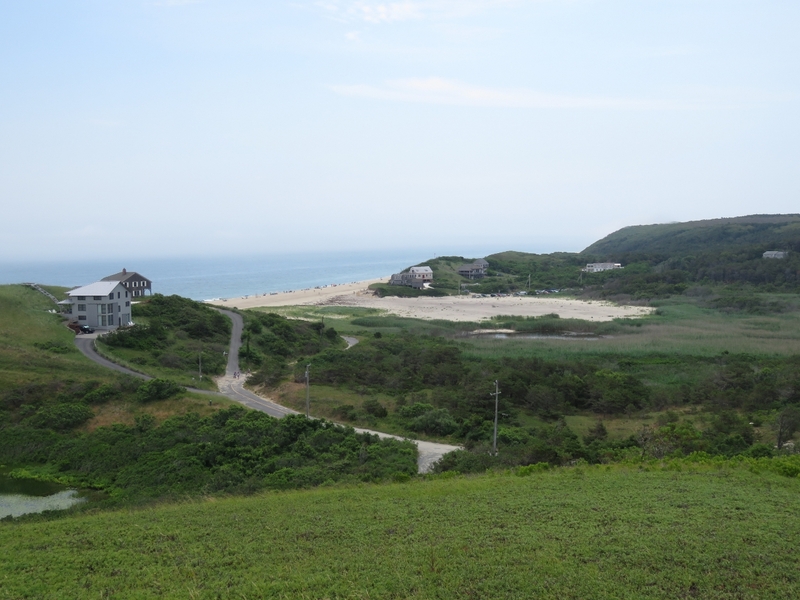 The Nauset Light Beach a few miles north of the visitor center was full of people with a constant stream arriving. 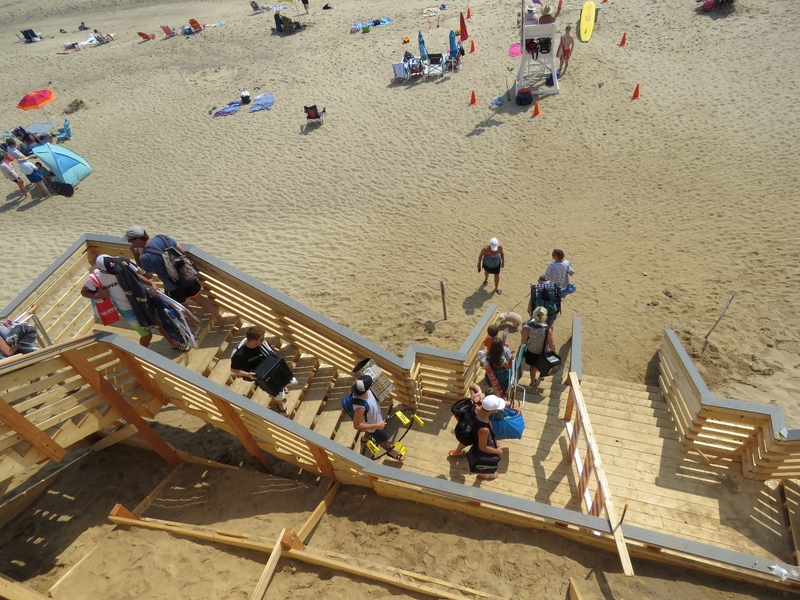 The group going down the stairs looked ready for a full day equipped with beach chairs and umbrellas, shade shelters, coolers, and a spike ball game. 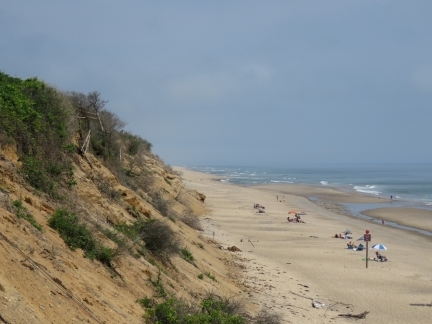 The Cape Cod ocean shore is constantly eroding at a rate of about 3ft per year. At the upper left of the photo are the ruins of a fence that has slid down the slope. 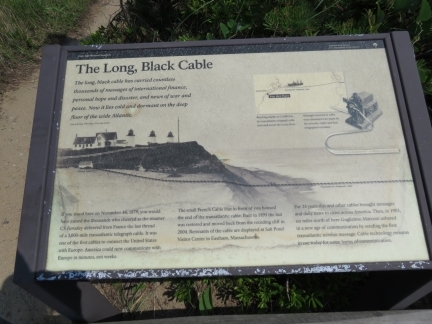 In 1879, one of the first transatlantic cables between America and Europe was completed here, part of an telegraph cable boom in the second half of the 18th century. The 3,000-mile cable reached depths of 15,000 feet and routed from here to Newfoundland then across to France. 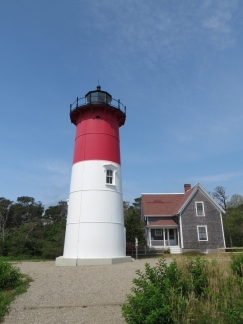 Nauset Light originally was erected in Chatham, Cape Cod to the south in 1877. 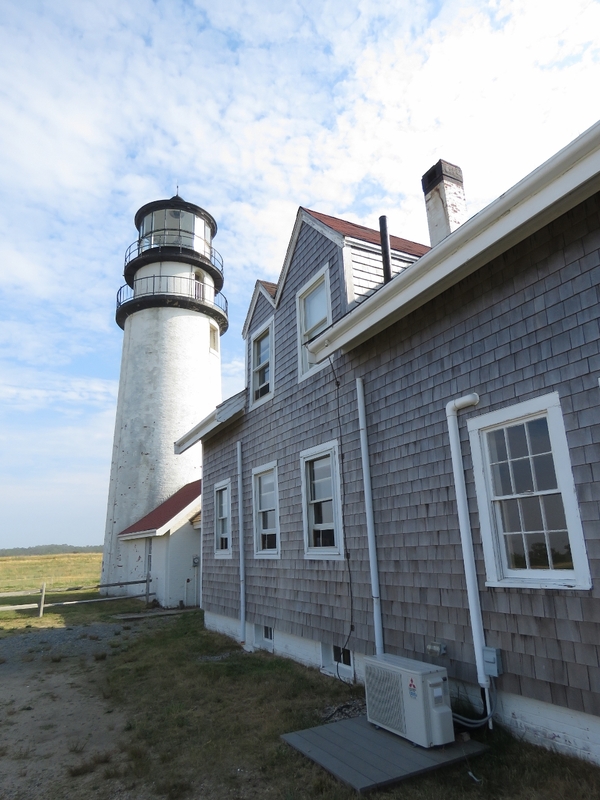 The light was dismantled in 1923 and reassembled in the current area about 275 feet from the edge of the bluff. 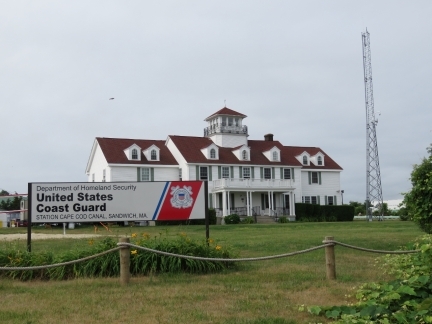 By 1993, the Coast Guard deemed the light obsolete and scheduled it to be dismantled. The Nauset Light Preservation Society raised funds to save the light and in 1996 moved it to higher ground, as 70 years of erosion at 3ft per year would have put the light about 100-ft from the cliff edge. 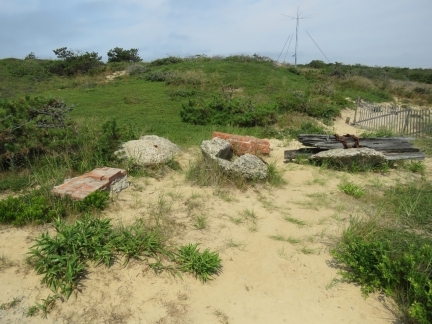 Ruins of Marconi’s historic South Wellfleet Wireless Station where in 1903 he completed the first two-way transoceanic message and the first wireless telegram between America and Europe. 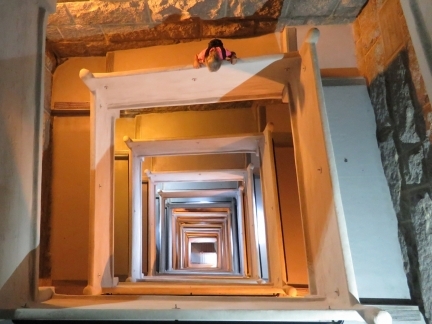 Four 210-ft wooden towers supported a massive antenna in the shape of an inverted pyramid whose whirling spark-gap rotor could be hear 4 miles downwind. 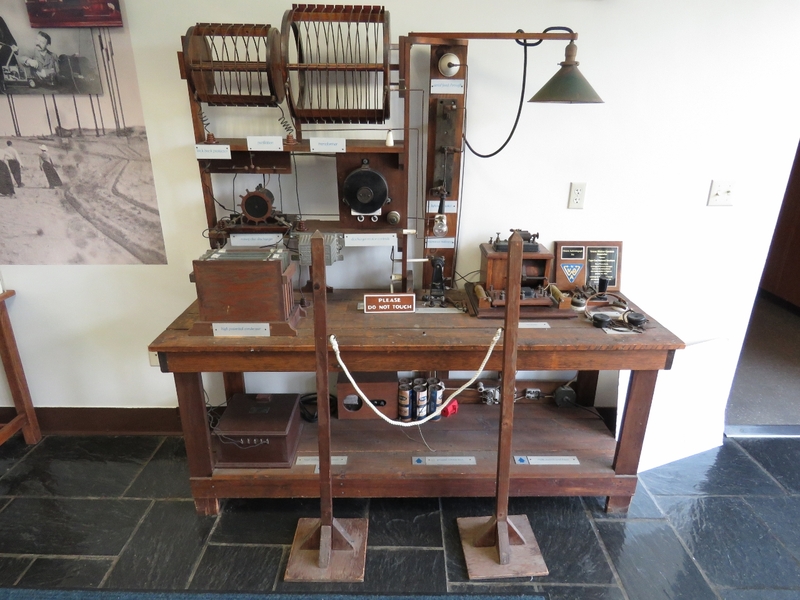 The Cape Cod National Seashore Park Headquarters building, near the Marconi station site, had a scale model of the original station and this working spark gap model. The scale model was initially on display at the station site, but the land had eroded to the point where it was only 32 feet from the cliff edge, so it was moved here. The view to sea over Ballston Beach from south Bearberry Hill along the Pamet Area Trails. The 100-ft gap in the dune didn’t exist until a 1991 storm breached the dune, carrying sand and saltwater inland. 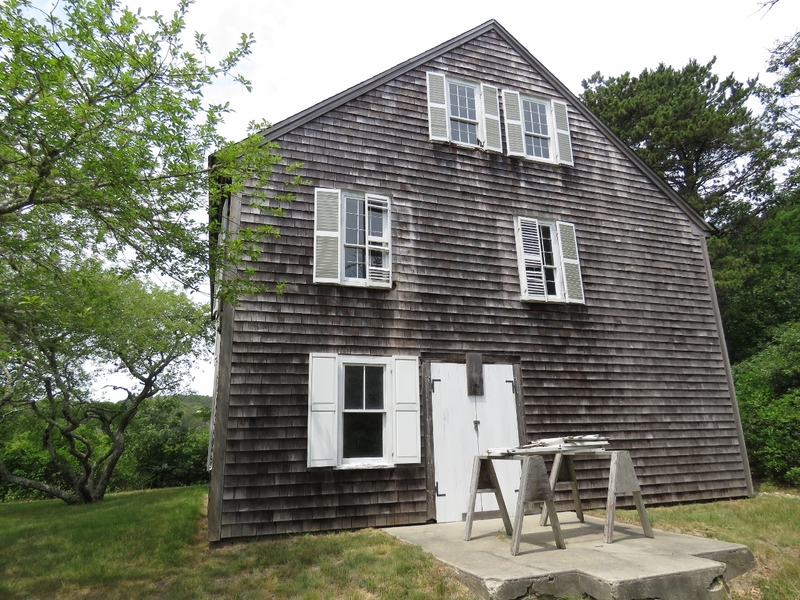 As Cape Cod’s fishing industry declined in the 1800s, falling sugar priced contributed to a new demand for cranberries and commercial bogs were carved into wetlands throughout the Cape. This cranberry boghouse along the Pamet Area Trails dates from that period. 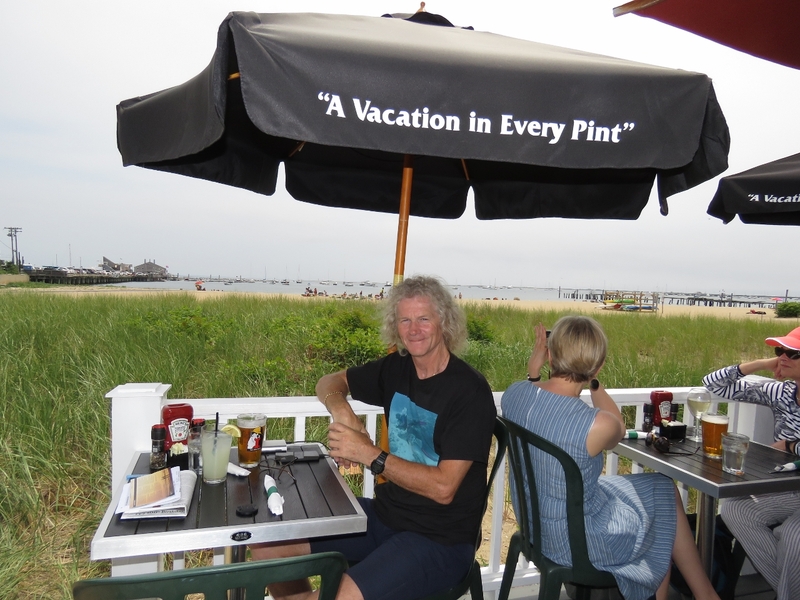 We continued north to Provincetown at the northern tip of Cape Cod. Traffic crawls along the narrow one-way street through town, so we parked our Zipcar at the first lot we found and continued on foot to check out the town and find a place for lunch. 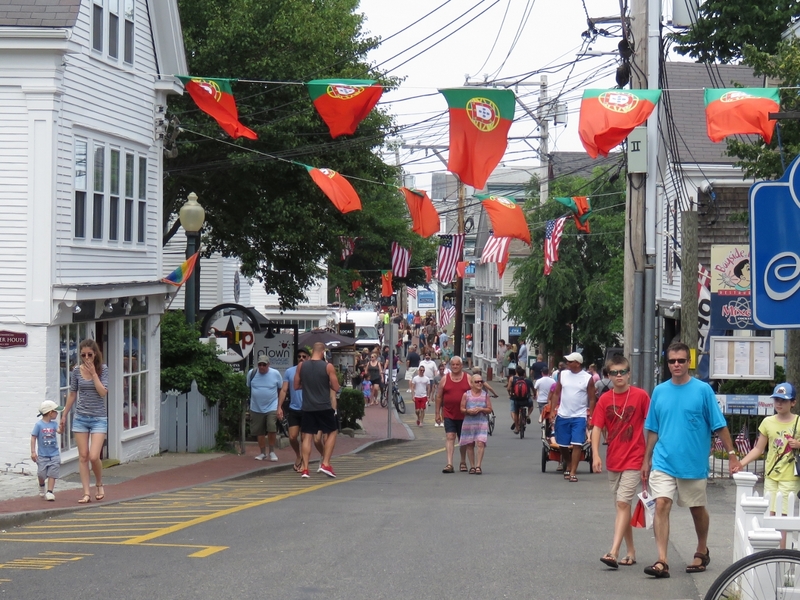 Provincetown has a lot of restaurants. 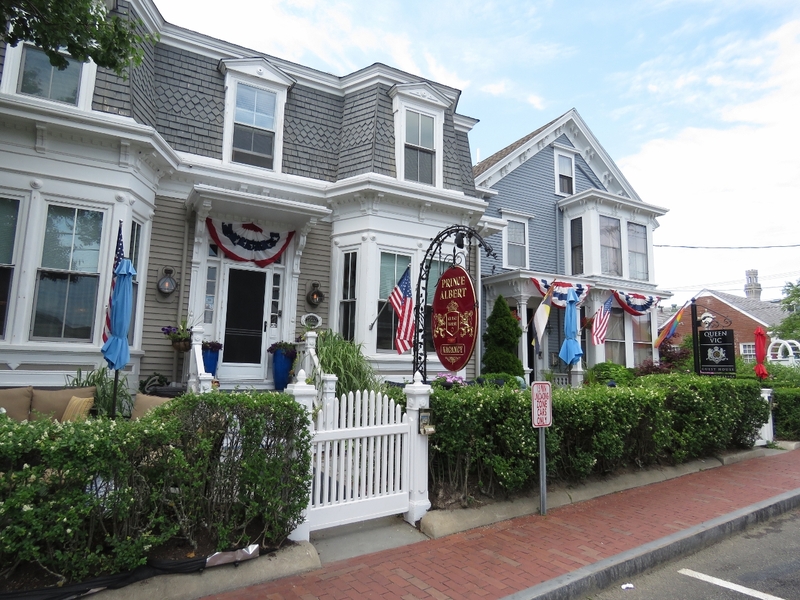 We eventually settled on the WayDownTown bistro for a delicious seafood meal with a beach view. Provincetown is full of guest houses in the traditional Cape Cod style, with not a chain motel in sight. Provincetown has a winter population of less than 3,000, but the summer population can reach 60,000. The streets, shops, cafes and restaurants were packed. 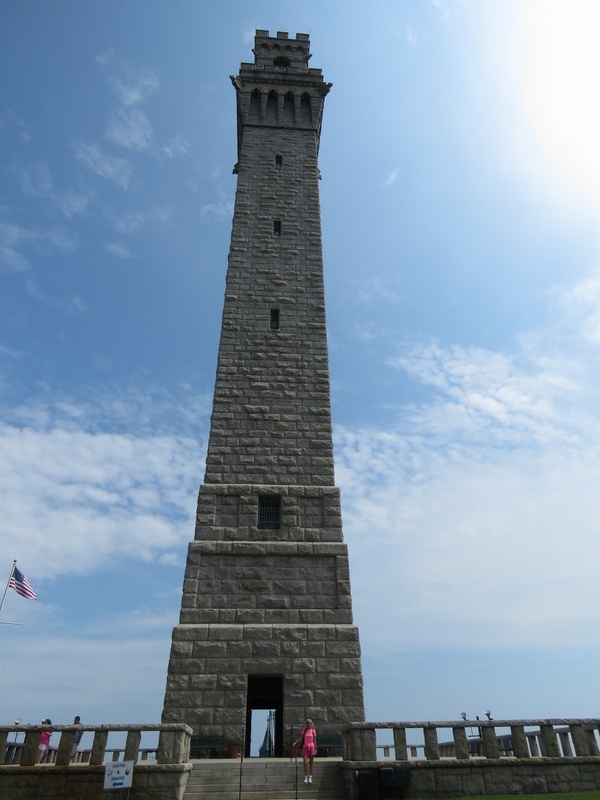 After lunch we walked up the hill to the 253-ft Pilgrim Monument, the tallest all-granite structure in the country. The Monument was built in 1907 to commemorate the first landing of the Mayflower Pilgrims in the New World at Provincetown on November 21, 1620. The Pilgrims later settled in Plymouth, where the soil was better for farming. 116 steps and 60 ramps lead the top of the Pilgrim Monument. Jennifer is looking back down from near the top. 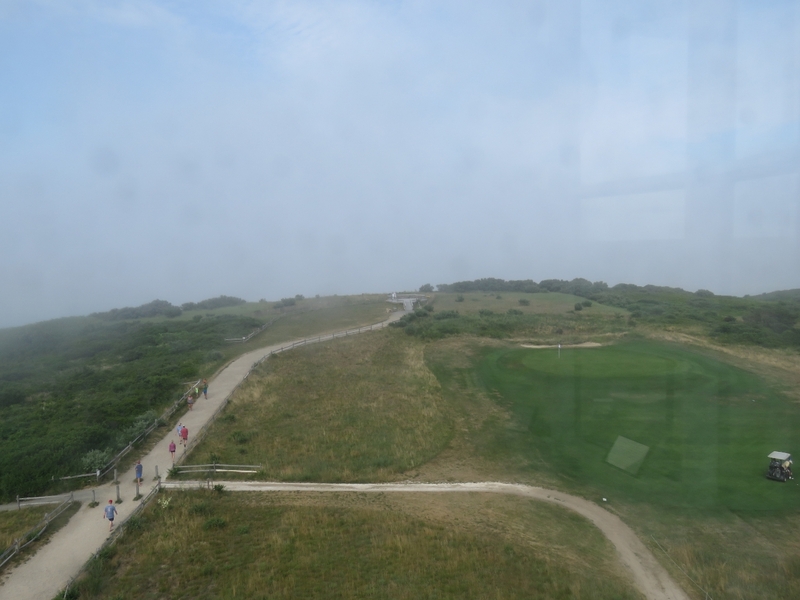 The view from the top of the monument was amazing. 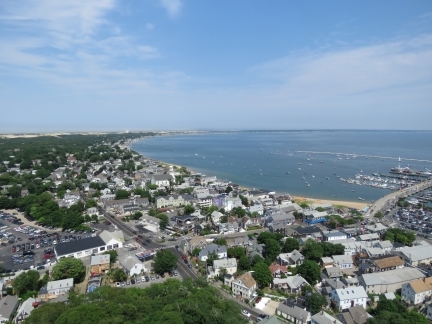 This is looking east toward the Provincetown waterfront, with the commercial pier and the Provincetown Marina at the right of the photo. 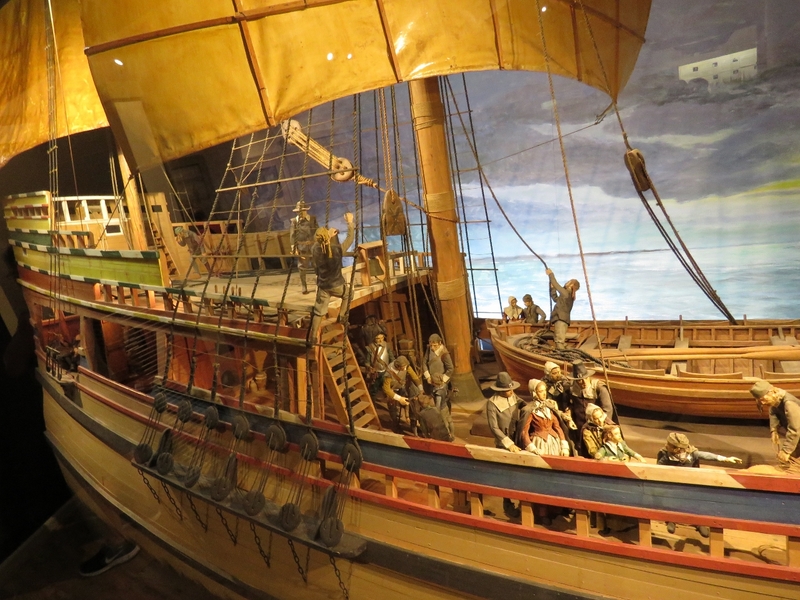 A detailed diorama in the Provincetown Museum of the Mayflower that carried the Pilgrims to the New World. 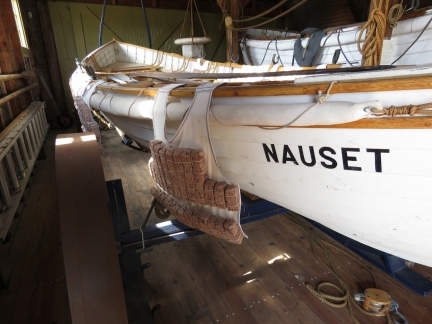 The museum is at the base of the Pilgrim Monument and has excellent exhibits detailing the town’s history and influences from the arrival of the Pilgrims in 1620, through the commercial whaling period that made Provincetown one of the richest in the country, to the later influx of literary notables such as playwrights Tennessee Williams and Eugene O’Neill, authors Norman Mailer, Jack Kerouac, and Kurt Vonnegut, former US Poet Laureate Stanley Kunitz, and Pulitzer Prize-winning poet Mary Oliver. The Old Harbor Life-Saving Station was built in Chatham in 1897, one of an eventual 13 that covered Cape Cod’s eastern shore to save shipwreck victims. Before the Cape Cod canal was built, all traffic had to go around treacherous Cape Cod where over 3,000 ships have wrecked. The stations were located five to eight miles apart and the beaches between monitored for shipwrecks during the day from watchtowers and patrolled on foot at night or in poor visibility. The Old Harbor Life-Saving station was decommissioned in 1944 and in 1977 the National Parks Service moved it to the current location north of Provincetown due to severe erosion at the original site. It is now a museum with much of the original furnishings and equipment intact. This is one of the original life-saving boats, with a cork life jacket hanging alongside. 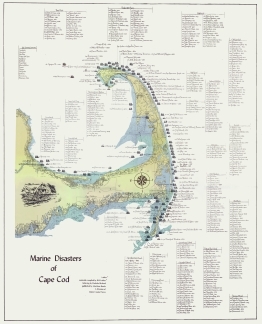 This map on the wall at the Life-Saving Station shows the astonishing number of shipwrecks that occurred along the Cape Cod coast and illustrates why the Life-Saving Stations were needed. The Province Lands Visitor Center has an 2nd-floor observation deck with a 360-degree view of the area. 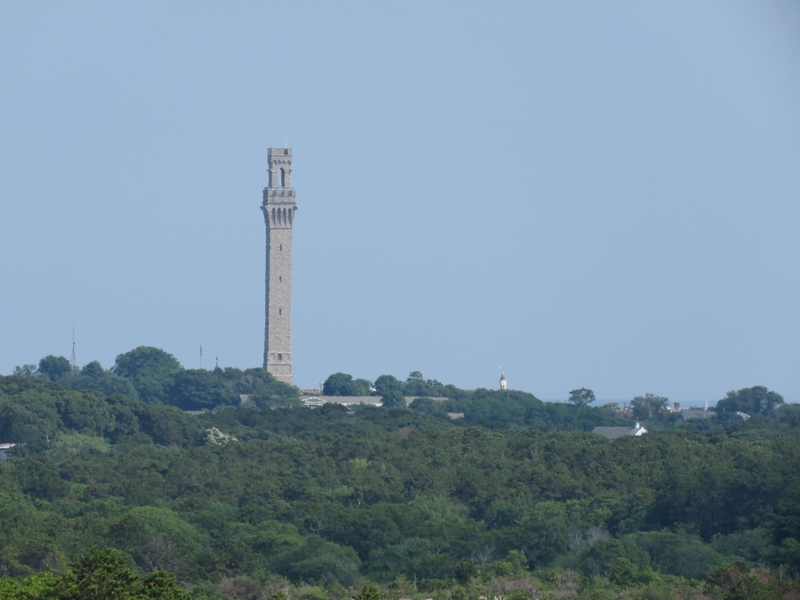 This is looking south to the Pilgrim Monument in Provincetown. Our final stop in a very long day was Highland Lightstation. The original light here was built in 1798, the first ever on Cape Cod. The current brick lighthouse was built in 1857. 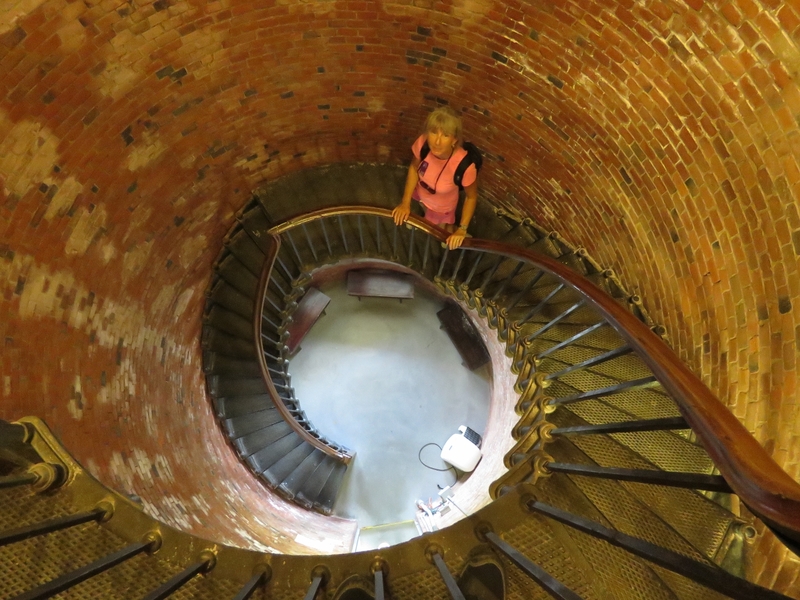 Climbing the steps to the top of the Highland Light. The view from the top of the lighthouse to its 1857 original site, roughly at the end of the path in the distance. In 1996 an incredible feat of engineering moved the 430-ton structure 450 feet back from the eroding cliff. 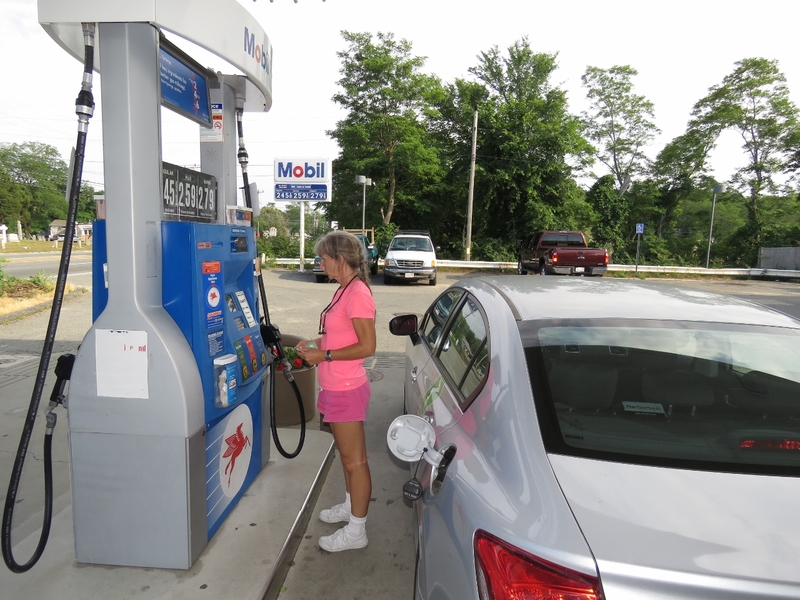 Filling up the Zipcar before we return home. 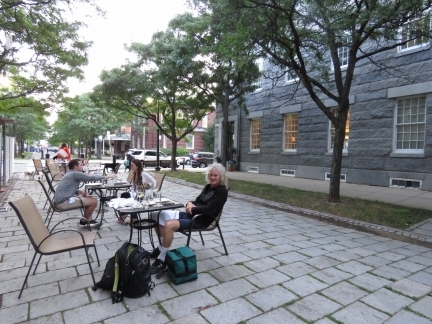 After dropping of our car, we finished the day with another excellent meal at the Navy Yard Bistro. I want to thank you for the years of vicarious enjoyment of your travels with your wife! I life in Seattle and knew of you via Scott Fogle who worked for me as the Xilinx Rep. I will continue to follow your adventures. Hi Dave. I just spent 3+ weeks back in Seattle. It’s still a fun city and technically it’s still home for us. 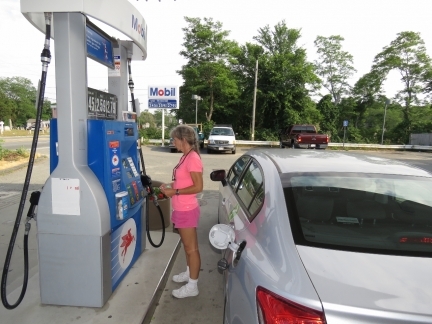 Thanks for the feedback on the blog and wish Scott well if you see him. This morning we checked into Canada at Lockport Nova Scotia and we’re now back underway for Newfoundland. We’re looking forward to getting back to the wilds.